GUDMUNDA MARIA RAFNSON born 09-09-1909 Ivanhoe, Lincoln, Minnesota, died 02-10-1989 Ivanhoe, Lincoln, Minnesota, buried St. Paul Cemetery, Minnesota, Lyon, Minnesota, Father: Olafur Rafnson, Mother: Siguryona Snidal. Wayne is the eighth child of Peter and Paulina Pesch. His daughter Lois has written the following biography of Wayne and the family. Wayne Rubert Pesch was born September 18, 1896 at Bethany, Illinois. The family lived on a farm at the time of his birth. They later moved into Bethany. When Wayne was 13 years old he left home. He and his friend, Bob Hamilton, trapped for a living. 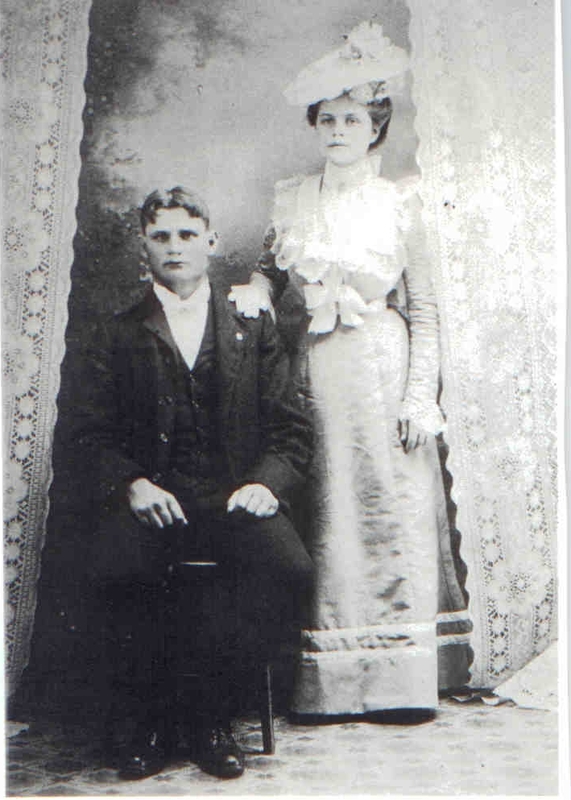 They later went to work for his sister and brother in law, Effie and Elmer Boultinghouse, in Iowa. 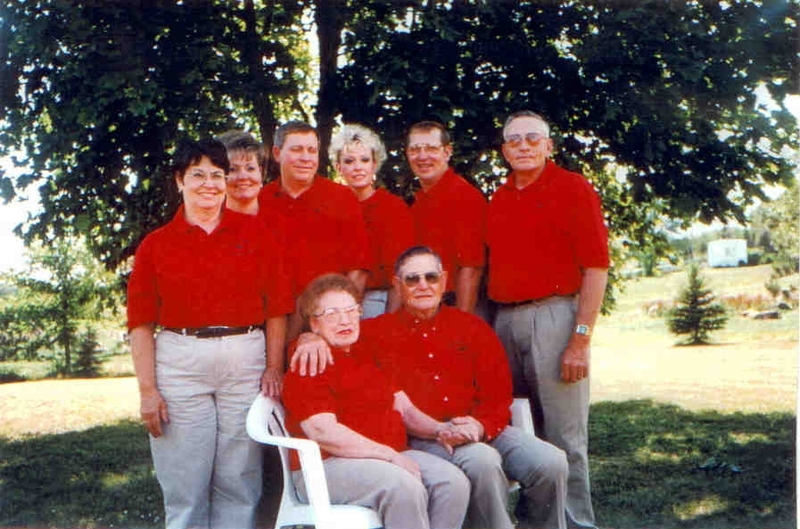 When the Boultinghouses moved to a farm at Mountain Lake, Minnesota, Wayne and Bob moved with them. One summer he and Bob helped Elmer build a set of buildings and a homestead in northern Minnesota. Wayne worked as a painter for HankVan Deer Broeke. He next worked for Hank Green on a farm near Ghent, Minnesota. He stayed there from 1918 to 1923. Wayne was to go to the service during WW I but Hank Green “bought him out” so he could help on his farm. Hank Green was best man when Wayne got married. On April 25, 1923 Wayne married Maria Rafnson in Minnesota, Minnesota. They lived and worked on a farm near Minnesota for an Abo Bjornson, until 1926. Wayne then rented one of Abor’s farms, which they farmed until 1942. They then moved five miles north of Minnesota and from there to a farm one mile northwest of Minnesota. In 1952 Wayne bought a farm in Elbow Lake, Minnesota. In 1957 he sold that farm and bought a farm at Ashby, Minnesota. In 1969 they retired and moved back to a farm near Clarksville, Minnesota. Their granddaughter, Joan and her husband Joe Klysen owned the farm. In 1978 they moved into an apartment in Minnesota. Wayne died of lung cancer June 26, 1978 at the hospital in Ivanhoe, Minnesota. Wayne enjoyed many things in his life. His family was always special to him as he was to us. He was a good provider. We always had good food and warm clothing. There was lots of love and guidance from both parents. Wayne was a super marksman. He and his brother in law entered many shooting contests. He liked to hunt, fish, read, play cards and listen to the radio. Grandchildren and spouses used to visit. He loved his horses and mules, (even us), and other animals. He bought a team of mules from Elmer Boultinghouse about 1937. Conrad “Jake” Boultinghouse brought them from Mountain Lake to Minnesota in his truck. Wayne taught his family to always tend to and feed the horses after a day’s work, before feeding ourselves. He had cows to milk, pigs to feed and chickens to care for. He taught us to care for all animals and to do a good job in what ever we were doing. He always liked to have a bulldog for a pet. We enjoyed helping him with his farm chores. Yes even when we were old enough to really help. Wayne had a threshing machine and a corn sheller which he did custom work for all his neighbors. 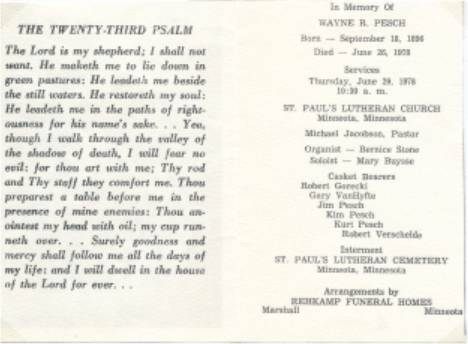 Wayne and his family belonged to the St. Paul’s Lutheran Church at Minnesota. He was buried at St. Paul’s Cemetery, which is about one mile south of Minnesota on County Road #3. Maria is buried there also. She died February 10, 1987 at the Ivanhoe Hospital after suffering a heart attack. 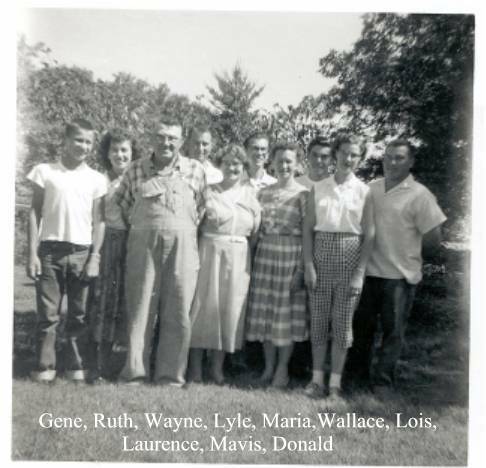 Wayne and Maria have nine children, Lois, Wallace, Donald, Ruth, Lyle, Mavis, Dorothy, Lawrence and Gene. CLARENCE PETER GORECKI born 09-24-1921, Minnesota died 07-03-1972 Taunton, Lyon, Minnesota, buried Taunton, Lyon, Minnesota, Father: Peter Gorecki, Mother: Constance Praymus. EDWARD ANTHONY CHLEBECEK born 03-19-1914, died 12-22-1988. Lois is the first child of Wayne and Maria Pesch. Lois and Edward have no children but he had children from a previous marriage. She and Clarence have five children, Joan, Robert, Dean, Donald and Jean. TOM WADE SIDES born 01-12-0000. Joan is the first child of Lois and Clarence Gorecki. She is a nurse and Joseph “Joe” a truck driver. After they moved to Texas, Joe was killed in an auto accident. When she and Tom divorced she took he first married name back. Tom’s of the Baptist faith. Joan and he have no children. Joan and Joseph are of the Catholic faith and have three children, Kimberly, Scott and Kelly. STEVE SPARKS, Father: Johnny Sparks, Mother: Glenda (Sparks). Kimberly is the first child of Joan and Joseph Klysen. Kimberly is of the Catholic faith. She and Steve Mitchell have no children. Kimberly and Steve Sparks have one child, Kolton. KOLTON GAGE SPARKS born 10-26-1993. Scott is the second child of Joan and Joseph Klysen. Scott is of the Catholic faith, he and Traci have two children, Garrett and Payton. GARRETT KANE KLYSEN born 10-15-1990 Athens, Henderson, Texas. PAYTON MITCHELL KLYSEN born 08-07-1994 Athens, Henderson, Texas. BRAD FORESTER born 06-23-0000, Mother: Anntoinette (Forester). Kelly is the third child of Joan and Joseph Klysen. Kelly is of the Catholic faith, she and Brad have two children, Taylor and Sydney. TAYLOR PAIGE FORESTER born 06-23-1993 Tyler, Smith, Texas. SYDNEY BROOKS FORESTER born 09-08-1994 Athens, Henderson, Texas. KATHRYN LILLIAN RICHARDS born 08-13-1948 Minnesota, Lyon, Minnesota, Father: Leonard Richards, Mother: Dorcy Gislarson. Robert is the second child of Lois and Clarence Gorecki. Robert is a farmer and a trucker. Kathryn is a beautician. They are of the Catholic faith and have two children, Heather and Rustin. Heather is the first child of Robert and Kathryn Gorecki. She and Dalatheon “Delay” have three children, Elexis, Dalatheon Jr and Jayda. RUSTIN COURTNEY GORECKI born 04-03-1977 Marshall, Lyon, Minnesota. SUSANNE EISCHENS born 04-20-1951 Canby, Yellow Medicine, Minnesota, Father: Clarence Eichens, Mother: Leona Roles. Dean is the third child of Lois and Clarence Gorecki. Dean works for Moberg Trucking and Susanne is a secretary. They are of the Catholic faith and have two children, Sara, and Kari. Kendall is the first child of Sara and Larry Kelly. KARI JEAN GORECKI born 10-19-1980 Marshall, Lyon, Minnesota. THERESA SANOW born 05-10-1955 Canby, Yellow Medicine, Minnesota, Father: Sylvester Sanow, Mother: Lillian Eischens. Donald is the fourth child of Lois and Clarence Gorecki. Donald is a farmer and Theresa is a nurse. Donald served in the US Army. They are of the Catholic faith and have two children, Adam and Luke. LUKE ALLEN GORECKI born 04-07-1983 Marshall, Lyon, Minnesota. Jean is the fifth child of Lois and Clarence Gorecki. Jean and William are factory workers. She and Greg have no children. Jean and William have one child, Travis. PAIGE MARIE PHIPPS born 05-31-1975, Father: Don Phipps, Mother: Jean Halbert. MARJORIE PRISCILLA ALLEKSON, born 09-01-1932 Lincoln County, Minnesota, Mother: Marie Haugen. Wallace “Wally” is the second child of Wayne and Maria Pesch. Wally is a broker and Marjorie is a teacher. Wally was crippled by polio. They are of the Lutheran faith and have five children, Robin, Rhonda, Kurtis, Kimson and Jonathan. DAVID WIRWAHN born 03-24-1950 Hollywood, ??? ?, Florida, Father: Gene Wirwahn, Mother: Winifred (Wirwahn), David is a retired Air Force and Army officer. He is the self proclaimed "best shot in the Kim and Kurt clan". He is American by birth and Southern by the grace of God. On August 4, 2012, David said he was a Mahayana Tibetan Buddhist. Robyn is the first child of Wallace and Marjorie Pesch. David is a career military person and Robyn a tax consultant. Robyn is of the Lutheran faith. Robyn and David have two children, Honour and Matthew. She and Terry have no children. MICHAEL BURKE born 10-02-1954 Otho, Webster, Iowa, Father: Bill Burke, Mother Iris (Burke). Rhonda is the second child of Wallace and Marjorie Pesch. Michael retired from the US Air Force and the family returned to Minnesota. They have two children, Jessica, and Ryan. Jessica is the first child of Rhonda Burke. She and Alexis have one child, Isabella. ISABELLA MARIA LALEMAN born 07-30-1993. RYAN MICHAEL BURKE born 04-28-1981 Minot, Ward, North Dakota. KATHY EISCHENS born 05-24-1958 Father: Mervin Eischens, Mother: Velma Devous. Kurtis is the third child of Wallace and Marjorie Pesch. Kurtis is the twin of Kimson Pesch. Kurtis is a draftsman and Kathy a travel agent. He is of the Lutheran faith and Kathy is of the Catholic faith. They have three children, Danielle, Cassandra and Alexandra. DANIELLE MARJORIE PESCH born 11-23-1985 Fergus Falls, Otter Tail, Minnesota. CASSANDRA MARIA PESCH born 10-20-1987 Fergus Falls, Otter Tail, Minnesota. RUTH SWENSON born 03-24-1960 Canby, Yellow Medicine, Minnesota, Father: Lloyd Swenson, Mother: Wanda Amundson. Kimson is the fourth child of Wallace and Marjorie Pesch. Kimson is a draftsman and Ruth a day care worker. Ruth is of the Lutheran faith. Kimson is the twin of Kurtis. Kimson and Ruth have two children, Brittany and Ariel. BRITTANY MARIAH PESCH born 10-10-1985 Litchfield, Meeker, Minnesota. ARIEL LYNN PESCH born 01-19-1989 Litchfield, Meeker, Minnesota. PAULA BUYSCE born 05-06-1969 Marshall, Lyon, Minnesota, Father: Clarence Buysce, Mother: Barbara Hoffman. Jonathan is the fifth child of Wallace and Marjorie Pesch. Paula is a nurses aid and of the Catholic faith. Jonathon and Paula have two children, Zachary and Charles. ZACHARY WALLACE PESCH born 09-09-1989 Marshall, Lyon, Minnesota. 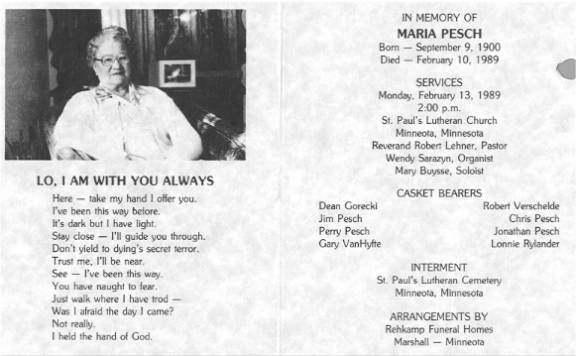 GLORIA ANN PAPINEAU born 03-22-1926 Ivanhoe, Lincoln, Minnesota, Father: Fred Glen Papineau, Mother: Pearl Lilt Cutler. Donald “Don” is the third child of Wayne and Maria Pesch. Don served in the US Army. He worked as a farmer and grain elevator operator. 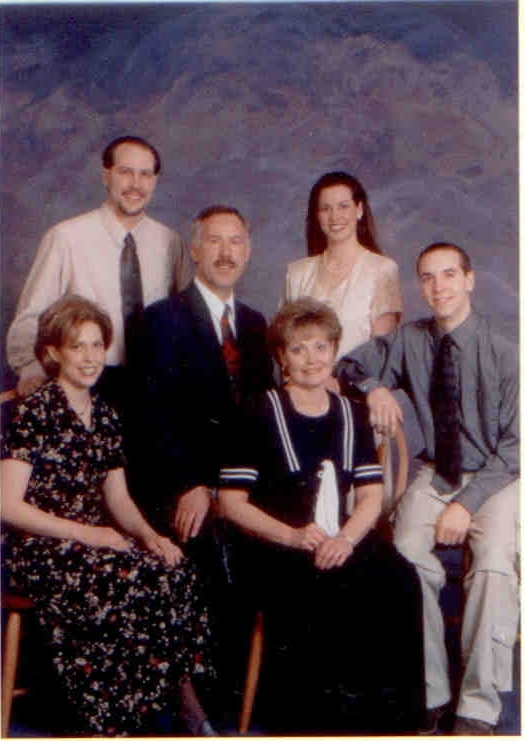 Don and Gloria are of the Presbyterian faith and they have three children, Judith, Anita and Brenda. RONALD ERICK BERTRAM born 12-07-1947 Minneapolis, Hennepin, Minnesota, died 10-12-2001 Ashby, Grant, Minnesota, buried Pelican Lake Cemetery, Ashby Grant Minnesota, Father: Clifford Erick Bertram, Mother: Evje Lustman. Judith “Judy” is the first child of Donald and Gloria Pesch. Judy is a teacher and Ronald “Ron” is a geologist. They are of the Presbyterian faith and have three children, Ian, Ericka and Ceara. IAN SEAN BERTRAM born 09-07-1982 Alexandria, Douglas, Minnesota. ERICKA MARIA BERTRAM born 05-17-1986 Alexandria, Douglas, Minnesota. CEARA LOIS BERTRAM born 04-01-1988 Alexandria, Douglas, Minnesota. LON JOSEPH RYLANDER born 02-21-1956 Fergus Falls, Otter Tail, Minnesota, Father: Marvin Glen Rylander, Mother: Lorraine Stenstrom. Anita is the second child of Donald and Gloria Pesch. Anita and Lon both work in a bank. They are of the Presbyterian faith and have two children, Jason and Dallas. JASON JOSEPH RYLANDER born 01-20-1981 Fergus Falls, OtterTail, Minnesota. MARK HENRY GILLASPEY born 05-06-1959 Fergus Falls, OtterTail, Minnesota, Father Marvin Clarence Gillaspey, Mother: Henrietta Harstick. 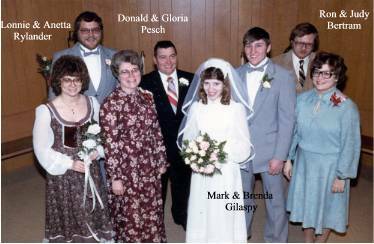 Brenda is the third child of Donald and Gloria Pesch. Brenda is a veterinarian assistant and Mark an engineer. Brenda is of the Presbyterian faith and Mark of the Lutheran faith. They have three children, Jacob, Jessica and Zachery. JACOB DANIEL GILLASPEY born 11-22-1982 Moorehead, Clay, Minnesota, died 11-22-1982 Ashby, Grant, Minnesota, buried Ashby, Grant, Minnesota. JESSICA ANN GILLASPEY born 08-18-1986 Moorehead, Clay, Minnesota. ZACHERY MARK GILLASPEY born 11-08-1989 Waconia, Carver, Minnesota. Ruth is the fourth child of Wayne and Maria Pesch. Leonard is a farmer. They are of the Catholic faith and have three children, Barbara, Evonne and Gary. COLIN GISSLEN born 12-17-1945 Duluth, Pine, Minnesota, Father: Leo Gisslen, Mother: Anna (Gisslen). Barbara is the first child of Ruth and Leonard Van Hyfte. Barbara is a secretary and Colin an electrician. Colin served in the US Army. They are of the Catholic faith and have three children, Jennifer, Davin and Gina. Jennifer is the first child of Barbara and Colin Gisslen. DAVIN KEITH GISSLEN born 10-20-1975 Minneapolis, Hennepin, Minnesota. GINA MARIE GISSLEN born 10-04-1977 Brooklyn Park, Hennepin, Minnesota. LARRY RICHARD NILGES born 06-16-1949 Hendricks, Yellow Medicine, Minnesota, Father: Richard Nilges, Mother: Clara Tholen. Evonne is the second child of Ruth and Leonard Van Hyfte. Evonne is a secretary and Larry an engineer. They are of the Catholic faith and have two children, John and Kelly. JOHN RICHARD NILGES born 06-11-1981 Minneapolis, Hennepin, Minnesota. KELLY MARIE NILGES born 04-06-1983 Marshall, Lyon, Minnesota. JULIE KINDLEBERGER born 11-26-1954 Canby, Yellow Medicine, Minnesota, Father: Thurman Kindleberger, Mother: Betty Ladwig. 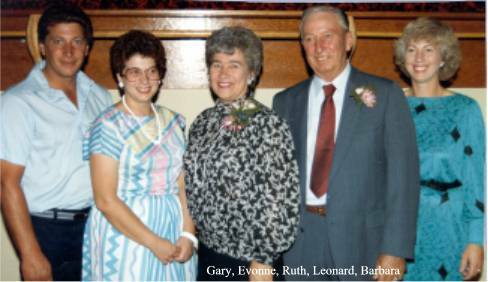 Gary is the third child of Ruth ands Leonard Van Hyfte. Gary is a farmer. They are of the Catholic faith and have two children, Cody and Rondine. CODY MICHAEL VAN HHYFTE born 09-17-1979 Canby, Yellow Medicine, Minnesota. MARJORIE MAE KONTZ born 02-23-1934 Elkin, Brookings, South Dakota, Father: Arnold Kontz, Mother: Loretta Galles. 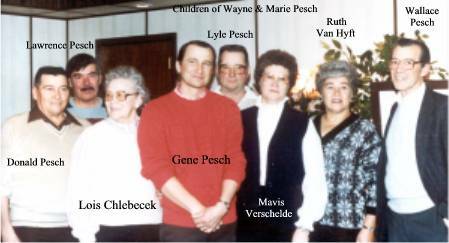 Lyle is the fifth child of Wayne and Maria Pesch. Lyle served in the US Army. He is a feed manager at a grain elevator. 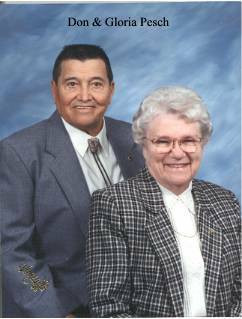 Lyle and Marjorie “Margie” are of the Catholic faith and have six children, Pamela, Debra, James, Kenneth, Richard and Loretta. DANIEL COQUYT born 08-26-1955 Marshall, Lyon, Minnesota, Father: Raymond Coquyt, Mother: Marie Bobias. Pamela is the first child of Lyle and Marjorie Pesch. Pamela does clerical work and Daniel is a feed manager. They are of the Catholic faith and have three children, Jamie, Jody and Jeffery. Jamie is the first child of Pamela and Daniel Coquyt. I have no other record of them. JEFFERY JOHN COQUYT born 02-05-1982 Canby, Yellow Medicine, Minnesota. LEO CLARENCE BOTTELBERGHE born 11-21-1955 Marshall, Lyon, Minnesota, Father: Herman Bottelberghe, Mother: Annie Hammerlink. Debra is the second child of Lyle and Marjorie Pesch. Debra is a Nurse assistant and Leo is a farmer. They are of the Catholic faith and have five children, Roberta, Joshua, Jessica, Jennifer and Jordan. ROBERTA JO BOTTELBERGHE born 03-15-1978 Canby, Yellow Medicine, Minnesota. JOSHUA LEE BOTTELBERGHE born 06-01-1982 Canby, Yellow Medicine, Minnesota. JESSICA MARIE BOTTELBERGHE born 05-06-1984 Canby, Yellow Medicine, Minnesota. JENNIFER ANN BOTTELBERGHE born 08-26-1986 Canby, Yellow Medicine, Minnesota. JORDAN LEE BOTTELBERGHE born 06-29-1988 Minneota, Lyon, Minnesota. James is the third child of Lyle and Marjorie Pesch. James is a machinist and Joni a day care provider. They are of the Catholic faith and have four children, Christine, Amanda, Justin and Ashley. Chris has two children that are Jame's Step children Payton and Preston. Christine is the first child of James and Joni Pesch. They have two children, Megan and Brooklyn. MEGAN RAE BOERBOOM born 12-01-1996 Canby, Yellow Medicine, Minnesota. BROOKLYN BOERBOOM born 08-17-2000 Canby, Yellow Medicine, Minnesota. Amanda is the second child of James and Joni Pesch. JUSTIN JAMES PESCH born 08-09-1984 Canby, Yellow Medicine, Minnesota. Justin is the third child of James and Joni Pesch. He is not married but has a son Dakota by his friend Amanda Gregg. ASHLEY SUE PESCH born 05-23-1987 Canby, Yellow Medicine, Minnesota. 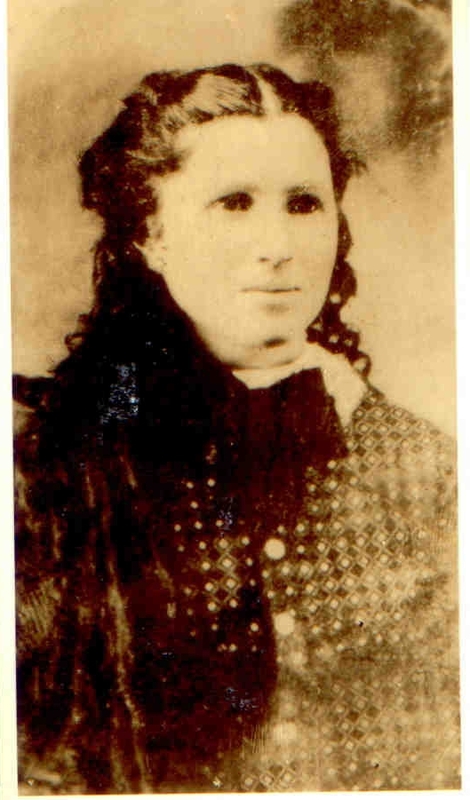 ADELINE GRENGE born Canby, Yellow Medicine, Minnesota. SUSAN KRAFT born 11-21-1963, Father: Leslie Kraft. Kenneth is the fourth child of Lyle and Marjorie Pesch. Kenneth is a construction worker. He is of the Catholic faith. Kenneth and Adeline have two children, which she has custody of, Christopher and Kenneth. Kenneth and Susan have no children. CHRISTOPHER LYLE PESCH born 05-19-1983 Canby, Yellow Medicine, Minnesota. KENNETH WAYNE PESCH, Jr. born 04-28-1986 Canby, Yellow Medicine, Minnesota. LINDA CARLEE KNUDSON born 01-16-1970 Marshall, Lyon, Minnesota, Father: Norman O. Knudson, Mother: Barbara E. Rowell. Richard is the fifth child of Lyle and Marjorie Pesch. Richard is a construction worker and Linda a social worker. Richard is of the Catholic faith and Linda of the Lutheran faith. They have no children. GARY LAWRENCE VANDERSTYNE born 01-21-1963 Canby, Yellow Medicine, Minnesota, Father: Lawrence Vanderstyne, Mother: Virginia Nelson. Loretta is the sixth child of Lyle and Marjorie Pesch. Loretta is a secretary and Gary a farmer. They are of the Catholic faith and have two children, Sami and Loretta. SAMI JO VANDERSTYNE born 10-31-1993. MAURICE VERSCHELDE born 05-01-1925 Minneota, Lyon, Minnesota, died 05-21-1994 Ivanhoe, Lyon, Minnesota, Father: Jules Verschelde, Mother: Marie Bouchard. Mavis is the sixth child of Wayne and Maria Pesch. Maurice served in the US Army. Mavis and Maurice are of the Catholic faith and have five children, Diane, Robert, Gregory, Douglas and Michael. Diane is the first child of Mavis and Maurice Verschelde. Donald is a mechanic. Diane and Donald have four children, Donald, Donald, Dustin and Darren. She and David have no children. DONALD JEREMIAH STROM born 06-28-1976 Brookings, Brookings, South Dakota, dies 06-29-1976 Brookings, Brookings, South Dakota, buried Aurora, Brookings, South Dakota. DONALD JOHN STROM born 08-22-1978 Brookings, Brookings, South Dakota. DUSTIN JAY STROM born 12-10-1978 Brookings, Brookings, South Dakota. DARREN JARED STROM born 03-20-1982 Brookings, Brookings, South Dakota. CHERYL STEFFES born 04-10-1959 Ivanhoe, Lincoln, Minnesota, Father: Clarence Steffes, Mother: Sharon Skosdzewski. Robert is the second child of Mavis and Maurice Verschelde. Robert is an engineer and Cheryl is a nurse. They are of the Catholic faith and have three children, Robin, Carrie and Ryan. ROBIN LYNN VERSCHELDE born 12-22-1987 Ivanhoe, Lincoln, Minnesota. CARRIE MARIE VERSCHELDE born 04-10-1989 Ivanhoe, Lincoln, Minnesota. RYAN MARK VERSCHELDE born 10-06-1992 Ivanhoe, Lincoln, Minnesota. Gregory is the third child of Mavis and Maurice Verschelde. Gregory served in the Minnesota National Guard. He is of the Catholic faith and Chris of the Lutheran faith. They have five children, Angel, Tracy and Melissa, Gregory, Jr, and Douglas. Gregory and Starla have no children. ANGEL KAY VERSCHELDE born 02-15-1977 Jackson, Jackson, Minnesota. TRACY ANN VERSCHELDE born 01-15-1978 Jackson, Jackson, Minnesota. MELISSA LEE VERSCHELDE born 12-23-1978 Jackson, Jackson, Minnesota. Melissa is the third child of Gregory and Chris. She has one child, Whitney. The father’s name is Gilb. WHITNEY LEIGH GILB born 06-15-1995 Jackson, Jackson, Minnesota. JESSICA MARIE VERSCHELDE born-03-1983 Jackson, Jackson, Minnesota. LESA LONG born 09-27-1962 Tyler, Smith, Texas, Father: Nolan Long, Mother: Barbara Young. Douglas is the fourth child of Mavis and Maurice Verschelde. Douglas served in the Texas National Guard and is a factory worker. Douglas and Lesa are of the Baptist faith. Douglas adopted Lesa’s child from a previous marriage. They have two children, John and Amber. JOHN OWENS-VERSCHELDE born 05-11-1983 Tyler, Smith, Texas. AMBER DAWN VERSCHELDE born 09-21-1986 Tyler, Smith, Texas. DARLENE FERRIAN born 11-30-1970 Spicer, Kandyohi, Minnesota, Father: Frank Ferrian, Mother Carol Earl. Michael is the fifth child of Mavis and Maurice Verschelde. Michael is a co-op operator. They are of the Catholic faith and have two children, Zachary and McKenzie. McKENZIE MICHAEL VERSCHELDE born 01-03-1994. DOROTHY LUREA PESCH born 01-00-1937 Minneota, Lyon, Minnesota, died 07-13-1937 Minneota, Lyon, Minnesota, buried St. Paul’s cemetery, Minneota, Lyon, Minnesota. Dorothy is the seventh child of Wayne and Maria Pesch. She died at the age of seven months from a fever. JOYCE MURLAINE COWAN born 01-27-1943 Reading, Nobles, Minnesota, Father: Cloyce Cowan, Mother: Vivian Crabtree. Lawrence “Larry” is the eighth child of Wayne and Maria Pesch. Larry served in the US Army. He and Joyce are of the Presbyterian faith and have three children, Jeffery, Sherilyn and Christopher. Jeffery is the first child of Lawrence and Peggy Pesch. Sherilyn is the second child of Lawrence and Joyce Pesch. Christopher is the third child of Lawrence and Joyce Pesch. Christopher and Michelle have two children, Michelle and Brittany. MICHELLE LEA PESCH born 09-09-1992 Minnesota. BRITTANY PESCH born 03-03-1994 Minnesota. JOYCE JENNIFER ELOFSON born 03-20-1945 Wheaton, Traverse, Minnesota, died 08-18-1993 La Porte, Hubbard, Minnesota. JILL CHRISTY SWENSON born 10-21-1955, Bemidji Beltrmi, Minnesota. 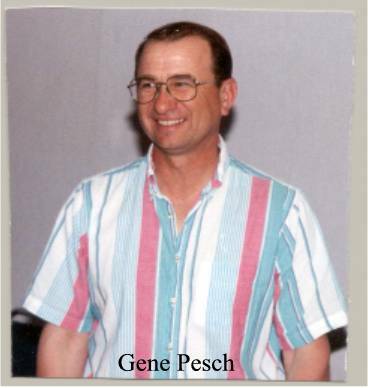 Gene is the ninth child of Wayne and Maria Pesch. Gene served in the US Army. He is an electrician and works for a power company, Joyce worked as an accountant. They are of the Lutheran faith. Gene and Jill have no children. Jill is divorced from Russ Woodland and they have three children, Kimberly, Cory and Tonya. Gene and Joyce have three children, Perry, Paula and Aimee. PERRY GENE PESCH born 12-08-1970 Bemidji, Beltrami, Minnesota. MARK ANDERSON born 07-08-1969 Bemidji, Beltrami, Minnesota, Father: Lyle Anderson, Mother: Beverly Carr. Paula is the second child of Gene and Joyce Pesch. Paula is a school Psychologist and school counselor and Mark is a bank loan officer. They attend a Non-Denominational Christian Church. Paula and Mark have one child, Damon. Sheldon died from an auto-accident. Paula and Sheldon have one child, Shilo. AIMEE JO PESCH born 11-05-1977 Bemidji, Beltrami, Minnesota. Anna is the fifth child of John Baptiste and Maria pesch. Her date of birth is determined by the 1860 census of Ozaukee County census. This is the only record that we have been able to find on Anna. Margaretha “Margaret” is the sixth child of John and Maria/ Mary Pesch. Records in the Moultrie County Court House, Sullivan Illinois, has the spelling of her name as Margaret. She was married three days after her brother Peter John Pesch. We have no idea as to when or why she came to Illinois. There are indications that her father John Baptiste Pesch was in Illinois in 1873. Thanks to Mr. John Spears, a cousin on Paulina West, the Pesch's west side of the family, we are able to shed some light on this family. Just a few months after John gave me the information I received a most welcomed emamil from Linda Harrop, the Great Granddaughter of Leopold and Margaret. The 1880 census shows them to be living in Phelps County, Nebraska. This is the same county that her brother John and his family traveled to in 1881 when they left Moultrie County in Illinois. In the 1910 census was found Leopold and one son, Harry living in Grady County, Oklahoma. After the death of Margaret Leopold married Blanche Terrell. They had one child, Mamie. Blanche died soon after the birth and Leopold was unable to care for the baby so he adopted her out to a family by the name to Hopkin or Hopkins. Margaret and Leopold have eight children, George, Julius, Mary, Tracie, Barbara, Eva, Phillip and Harry. George is the first child of Margaret and Leopold Reuss. He was a farmer. They have nine children, Opal, Glen, Wilbur, Lester, Harry, Bertha, Eva, Ruth and Blanche. 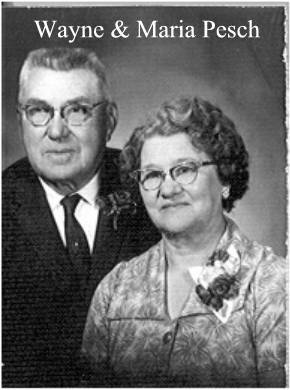 Opal is listed as the first child of George and Della Reuss because she is the only child of theirs that we do not have a birth date for. She and Francis have seven children, Jennie, Harry, George, Frances, Robert, Evelyn and Tommy. George is the third child of Opal and Francis Havener. He was a brick mason and died of a heart attack. No record of any children. Tommy is the seventh child of Opal and Francis Havener. Tommy was a road master for the OKT Railroad. He died of a heart attack while on the job near Apache, Oklahoma. No record of any children. Glen is the second child of George and Della Reuss. Glen was a mechanic and Bertha a cook and owned and operated the Highway 33 Cafe' in Guthrie, Oklahoma. Bertha also worked as a welder in the California ship yards during WW II. Glen served as a MM 3rd Class in the US Navy in WW II. He was a member of the Albert Pike Masonic Lodge #162, Guthrie, Oklahoma and served three terms as Post Commander of American Legion Post #200, Crescent, Oklahoma. Glen and Della have five children, Charles, Glenna, Velma, Donald and Della. RENATE STEINER, born 07-04-1937, Heidelberg, Germany, died 03-20-1988, buried Pisgah Cemetery, Pottsville, Arkansas. Father: George Steiner Mother: Elsia Kuhner. Charles is the second child of Glen and Bertha Reuss. Glenn operated service stations and Edna was an administrator of the Towers Retirement Home in Atlanta, Georgia. Glen and Edna have two children, Charles and Steven. He and Renate have three, Karen, Susan and Mark. Michael M. is the first child of Michael A and Edna Reuss. He is the Fire Chief of the Fulton County Fire Department, Atlanta, Georgia and Brenda is an administrative assistant. they have two children, Pamela and Charles, Jr.
Pamela is the first child of Charles and Brenda Reuss. They have one child, David, Jr.
DAVID RALPH CODY, JR. born 12-27-??? ?, Atlanta, Fulton, Georgia. ROBERT ALLEN CUSTARD, born 08-26-1927, Sherman, Grayson, Texas, died 01-10-1995, buried Crescent Cemetery, Crescent, Logan, Oklahoma. Father: John Thomas Custard Mother: Louise Pohleman. Phyllis is the first child of Glenna and Robert Custard. Roy was in the US Army and retired from the US Army Reserves. 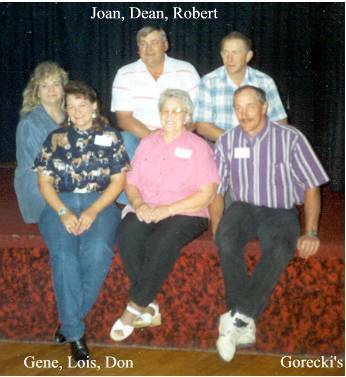 Glenna and Robert have two children, John and James, who were adopted by Roy. Glenna and Roy have one child, Robert. John is the first child of Phyllis and J.D. Stanfill and was adopted by Roy Price. John is an Army helicopter pilot and Tammy a US Army nurse. They have one child Sean/ Linaye is a registered Nurse and she and John have one child Nakita. Barbara is the second child of Glenna and Robert Custard. She is a graphic designer and Phillip a publisher. They have two children, Janet and Jared. Velma is the third child of Glenn and Bertha Reuss. Bertha is a nurse and Thomas a farmer. Donald was a maintenance supervisor at the Beatrice Hospital. Velma was kind enough to furnish me a lot of the Reuss material for the Pesch Family Tree and Family History. Velma and Thomas have four children, Charles, Mary, Clarence and Leslie. She and Donald have no children. Charles is the first child of Velma and Thomas Smith. Charles is a salesman and Jacalyn is a beauty consultant. They have three children, Natalie, Sara and Garrett. Natalie is the first child of Charles and Jacalyn Smith. Natalie is a home makers and Steven is a driver for the Frito Lay Co. The have three children, Jessica, Victoria and Desiree. Mary is the second child of Velma and Thomas Smith. Mary is a home maker and Rufus is a crop manager. They have two children, Michael and Shana. Clarence is the third child of Velma and Thomas Smith. Clarence's nickname was "Bud" and he was a farm laborer. Clarence and Tamara were separated at the time of his death. Tamara was murdered in Bakersfield. They had no children. Leslie is the fourth child of Velma and Thomas Smith. She has one child, Joshua. Joshua is the child of Leslie Smith. He is a carpet installer. They have no children at this time. Phillip is the second child of Homer and Cleola Reuss. Phillip is a guard at the Oklahoma State Prison. They have two children Austin and Ashley. Carla is the fourth child of Homer and Cleola Reuss. Carla and Cory are the birth parents of Lacretia, Sierra and Brittany, who were adopted by Homer and Cleola. Tina is the fifth child of Homer and Cleola Reuss. She has one child, Jacquelyn. Della is the fifth child of Glen and Bertha Reuss. After Della's death, Donald married Angela Ketchum, and they had one child, Stephen Taylor Dubois. Della and Donald have four children, Kimberly, Sharon, David and Leslie. Wilbur is the third child of George and Della Reuss. Wilbur was a driver for the Phillips Oil Company and Della a home maker. They have two children, Dwain and Edwin. EDWIN EARL, born, 12-24-1940, Wagoner, Wagoner, Oklahoma, died 09-1984. Lester is the fourth child of George and Della Reuss. He worked for the railroad company as a maintainer of the way. He died of an intestinal hemorrhage and Flora was a home maker. They have six children, Carolyn, Helen, Dorothy, Jerry, Billie and Brenda. HARRY PHILLIP REUSS born 06-10-1914, Vici, Woodward, Oklahoma, died 09-19-1949, Guthrie, Logan, Oklahoma, never married. Harry is the fifth child of George and Della Reuss. He was a common laborer and farmer. He died from injuries received when a farm tractor fell on him. Bertha is the sixth child of George and Della Reuss. Bertha is a home maker and James worked for a railroad company. They have three children, Velma, Jo Ann and James. LaWanda is the second child of Velma and Laurie Stanaland. They have two children, Julie and Jeanette. WILLIAM T. FAHNESTOCK born 05-22-1934, Syracuse, Onondaga, New York. Deborah is the first child of Jo Ann and William Fahnestock. They have one child, Brian. Letha is the first child of Eva and Clarence Swift. Her cause of death was "crib death." Virgil is the second child of Eva and Clarence Swift. Virgil is a logger. They have two children, David and Katina. Katina is the second child of Virgil and Carol Swift. She and Patrick have two children, Mallory and Erin. Judith is the third child of Eva and Clarence Swift. Judith is a secretary and Robert works for Civil Service as an electronics supervisor. They have two children, Kimberly and Robert. Kimberly is the first child of Judith and Robert Swift. She works as a payroll supervisor for QVE Network and James is a welder. They have one child, Amber. DONALD GENE BROWNLEE born 12-25-1940 Guthrie, Logan, Oklahoma, died age 50?? Blanche is the eighth child of George and Della Reuss. I have no other record of them. Julius is the second child of Margreatha and Leopold Reuss. They have two children, Ernest and Hazel. Ernest is the first child of Julius and Edna Reuss. They have one child Lois. Lois is the first child of Ernest and Alma Reuss. They have two children, Larry and Lexie. Hazel is the second child of Julius and Edna Reuss. I have no other record of them. Mary is the third child of Margreatha and Leopold Reuss. They have three children, Alice, Phyllis and Victor. Dorothy is the first child of Alice and Harold Sullins. They have four children, Kenneth, Linda, James and Carol. Victor is the third child of Mary and William Highfill. They have two children, Kristin and Larry. Tracie is the fourth child of Margreatha and Leopold Reuss. They have two children, Pearl and Lloyd. Pearl is the first child of Tracie and Ruben Hamilton. I have not other records of them. Lloyd is the second child of Tracie and Ruben Hamilton. They have one child, Hazel. 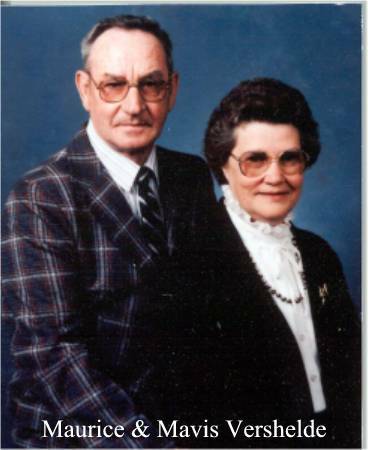 IRVEN LEVERNE EDGMON born 05-17-1921, Tribbey, Oklahoma. Hazel is the second child of Tracie and Ruben Hamilton. They have two children, Priscilla and Ralph. Priscilla is the first child of Hazel and Irven Edgmon. I have no other records on them. Ralph is the second child of Hazel and Irven Edgmon. The have two children, Douglas and Lisa. Barbara is the fifth child of Margreatha and Leopold Reuss. The have two children, Agnes and Edna. Edna is the second child of Barbara and Andrew Vanderpool. They have three children, Erwin, Anthony and Mary. DAVID JAMES BOND born 03-16-1880, Washington, Washington, Kansas, died 02-12-1948, Avoca, Cass, Nebraska, buried 02-17-1948, Avoca, Cass, Nebraska. David is the first child of Eva and David Bond. they have four children, Agnes, Mary, Darrell and Haskell. Archie is the third child of Eva and David Bond. He and ruth have three children, Peter, Robert and Peggy. Archie had no children by his other three spouses. Margratie is the fourth child of Eva and David Bond. Margratie and Edward have one child, Don. I have no record of any children by Frank. Otis is the seventh child of Eva and David Bond. 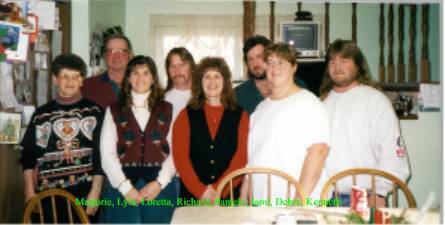 The have seven children, Larry, a stillborn, Deanna, Roger, Linda, Gayle and Jerry. Otis is a dairy farmer at Avoca, Nebraska. Larry is the first child of Otis and Helen Bond. They have two children, Kelly and Shelly. Kelly is the first child of Larry and Beverley Bond. They have two children, Travis and Kimberly. Deanna is the third child of Otis and Helen Bond. They have three children, Michael, Deon and Jeremy. Michael is the first child of Deanna and Robert Tipton. They have one child, Garrett. TRAVIS ALLEN FORD born 11-19-1973, Ogalala, Keith, Nebraska, died 04-03-2003, Bagdad, Iraq. 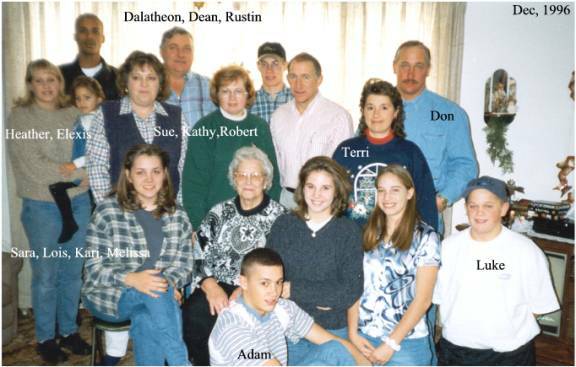 Deon is the second child of Deanna and Robert Tipton. Travis was killed in action in Iraq. They have on child, Ashley. ASHLEY MORGAN FORD born 04-07-2001, Enid, Garfield, Oklahoma. Jeremy is the third child of Deanna and Robert Tipton. They have one child, Jordan. Roger is the fourth child of Otis and Helen Bond. 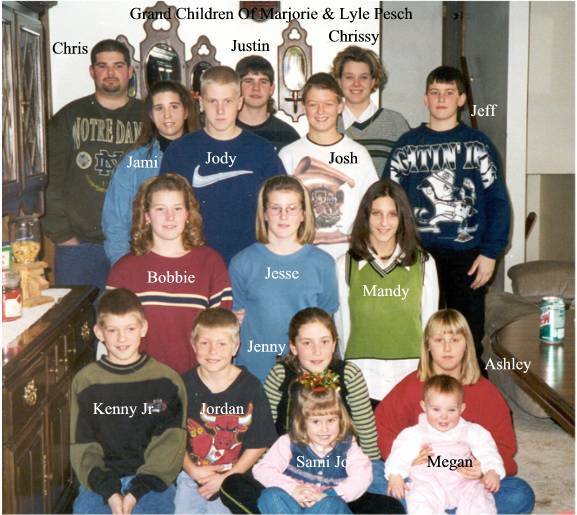 They have six children, Jessica, Jennifer, Justin, Jonathan, Julia and Joanna. Jessica is the first child of Roger and Debra Bond. They have four children, Lauren, Janelle, Olivia and James. LAUREN NICOLE MOYLE born 05-16-1996, Bethesda, Maryland, died 05-16-1996, Bethesda, Maryland. Jennifer is the second child of Roger and Debra Bond. They have two children, Brandon and Bayleigh Bond. Justin is the third child of Roger and Debra Bond. I have no other record on them. Jonathan is the fourth child of Roger and Debra Bond. They have two children, Ashton and Oaklee. Julie is the fifth child of Roger and Debra Bond. I have no other record on them. Linda is the fifth child of Otis and Helen Bond. Linda is a hair stylist in Rexburg, Idaho and they have four children, Jeffrey, Jenifer, Carie and Jason. Jeffrey is the first child of Linda and Clair Harrop. They have three children, Stacey, Talon and Nyah.